The 5-Minute Facial Workout - by Catherine Pez - ISBN: 978-0-7788-0471-0 - $19.95 - as if it isn't bad enough that I've been skipping the gym so not working out my body, but as it turns out, I've also been remiss in exercising the 50 muscles that I never knew I had in my face! The premise of the book is that just as we can exercise and tone our body's muscles, we can do the same with our facial muscles, which can ultimately make a marked difference in our appearance and can potentially eliminate the need for invasive plastic surgery. If you are getting a mental image of a little face gym with tiny barbells and treadmills, you aren't the only one, that's what I was thinking too - luckily the idea makes me smile which the book highly recommends - smiling works 25 facial muscles! 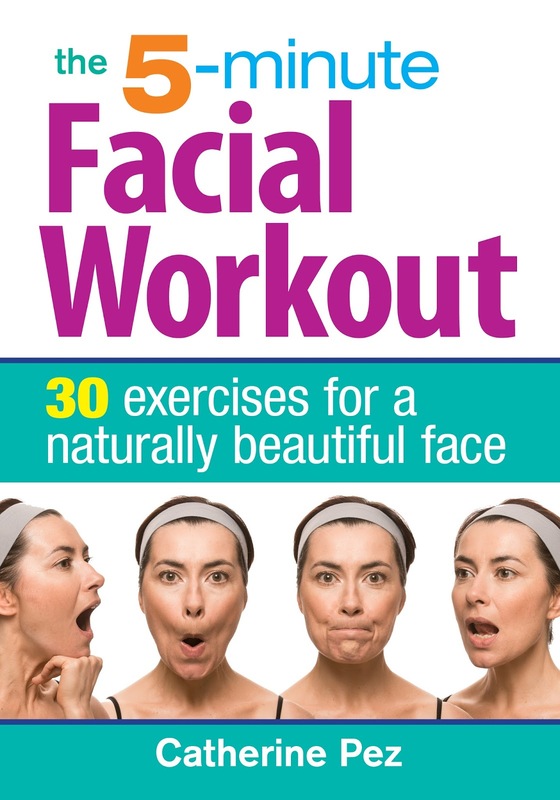 No tiny gym needed though, just your face and the movements from the book which you will find on each page with clear instructions and a photograph to demonstrate the movement for 30 exercises. Will you look like a total goofball doing them - yes indeedy! I do NOT recommend doing it in front of your spouse if he is the mocky type like mine and make sure there is no one nearby with a cellphone threatening to take pictures and post them on instagram! This is the kind of thing that is best done in private with no witnesses - like when you scarf down a whole box of donuts by yourself! I have no idea if this has really made any improvements to my face but I have to say, making silly faces does improve my mood and as my husband will tell you, that can only be a good thing!